JCB generators are designed to meet the needs of a very demanding worldwide market for both prime and standby power applications. Designed to suit all applications including residential, rental, construction, quarrying and mining industries, agricultural sectors and for use as back-up power supply for commercial applications such as hospitals, offices and datacentres. 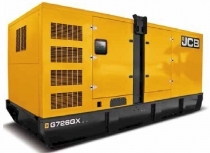 The G20QS to G220QS are the very latest generators in JCB's power products range. As with all JCB products, these generators are designed for maximum productivity and efficiency in the harshest environments.